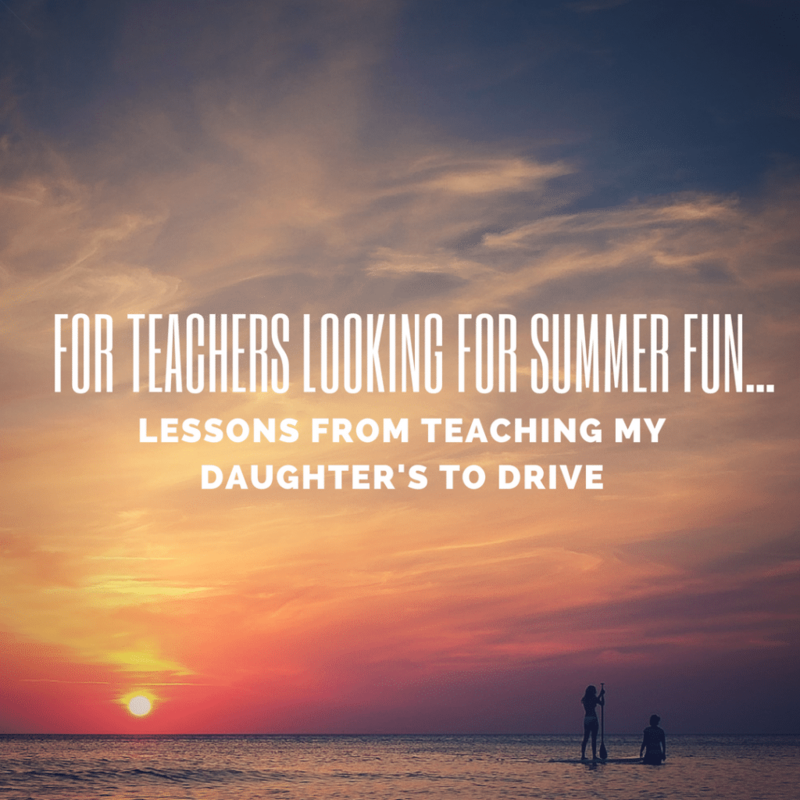 Are you a teacher looking to invite some extra excitement into your summer break? I have just the thing for you! Take on prepping two teenage daughters for their driver’s license road test. My number one (Charlie Chan speak for my oldest) is 19, and conventional wisdom would have most thinking that she should have had her license for a couple of years by now. But Chloe really has had little interest, is a little nervous about the whole driving thing, and is a little tentative and indecisive behind the wheel. This has led to a few slow-roll left turns that turn into near-stops in the middle of intersections, slow merges that certainly ticked-off some folks behind us, and a general directional deficit that could get her lost in her own hometown. Full disclosure: she inherited that last part directly from me. Now my second daughter is 17 years old (add about 4 months old) believes herself ready to drive for about the last 5 years. To the contrary behind the wheel, Brenna is maybe a bit over-decisive. The gas pedal must not be her friend because she continually pushes it away. Coming home we frequently deal with a “Y-style” left that scoots us off the main drag and up the country hill to our home, and this pedal-heavy approach is both a blessing and a curse at this location. Even though there’s a yellow stripe on the main road, and it’s called a “county highway”, the traffic is relatively light. Still, there is a knoll right there where my road meets this county highway. This stripes-and-knolls situation presents a danger because it means that: A) during the day there are no headlights to warn a driver of other/oncoming traffic; and B) the yellow stripes convince other drivers that highway speeds are okay. So enter the mix of Brenna’s tendencies and my instructional style as a teacher. Not to mention my child’s habit of miscommunication when it comes to clearly remember Dad’s words and deeds. “Of course I didn’t say it that way” is something I have had to say countless times. But I’ll get to that in a bit. My wife is the epitome of responsibility and caution when guiding our girls on the path to driver hood. So much so that the first time she approached this intersection with Brenna driving, her version of its proper execution had my daughter stopping, with traffic behind her, watching the knoll for an approaching car and then going. My approach, my instructional style when it comes to this turn is to have her slow to a 20-25 mph coast, with one foot on the brake, until nearly reaching the turn. If there’s no roof of an oncoming car rising into view over the knoll, I say “scoot” left quickly and get on the gas to get up the hill. So there I was, after they made it home alive, explaining what it was I had really said. I didn’t just say ‘hit the gas and go’ like some sort of maniac. Of course, it still wasn’t quite good enough for my wife. But I’m the teacher, right? So out come the manipulatives to demonstrate: two envelopes from our “incoming” pile and a small box act as the car my daughter is driving, the mythological oncoming car that may or may not be there, and the visibility-blocking knoll obscuring the view of the car that may or may not be there. The puppet theater-style show perfectly conveyed the “Watch for the oncoming car and stop if needed, and if you don’t see one coming get on the gas and zip out of the way” method. Of course, that’s when my wife gets another envelope and parks it on the bottom of our hill as if it’s a car pulling off where my daughters might try to pull on. “What if a car coming down the hill is right here?” she asks. From a teacher’s perspective she’s the smart kid who has asked a good but uncomfortable question, and now my lesson plan needs to be retooled a little. So both my girls are sitting in the living room with me as I type this. The one who may very well float too long in that intersection, and the other one that could give someone coming down our hill a heart attack when she rockets up the hill as she turns off the main road. Two different kids, two different styles, requiring the toolbox to be used in somewhat different ways. With my wife and youngest girl off visiting family, this teacher will be taking a couple students out on the road.